You know Him as Abba, Father, God, the Lord, the Almighty, or even as Daddy. But do you know Him as Friend? Do you love to spend time with Him? Do you look forward to your conversations, to your quiet times together? David sought God's company morning and night, Moses spoke with Him daily, and Abraham, believing and obeying the Father, "was called the Friend of God" (James 2:23). You, too, can have dynamic fellowship with the Father, with greater purpose and power than ever before. Experience the closeness of a friendship with God. 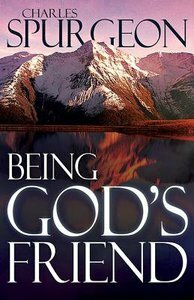 Learn the joys of Being God's Friend today.